We, too, are disappointed in Brian’s shirt selection. The HYSOR rocket has a blow down system that expels oxidizer at pressures as high as 2000 psi. The rocket plumbing has to be leak-proof to keep those high pressure gases from escaping while we fill the rocket. 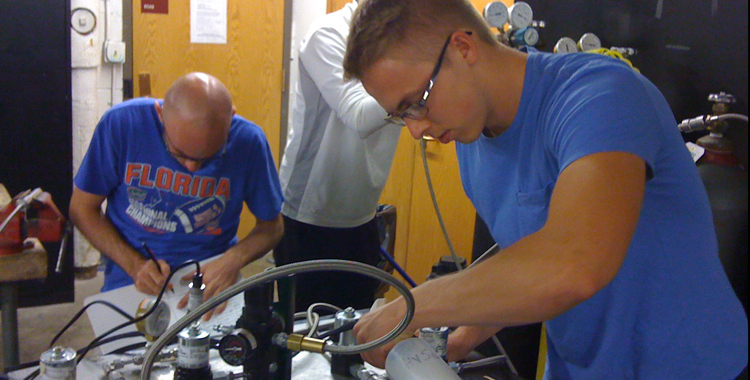 To test this, we hook up all of the rocket plumbing and the valves so we can test the seams for escaping gases. Bryce was our leak-tester extraordinaire, spraying soapy water on all of the seams to see if big bubbles formed. We found leaks on the main valve that flows oxidizer into the combustion chamber and on the T joints that string together the K-bottles. Since we’re using NPT pipe threads, it was likely we didn’t have enough teflon tape at the junctions or that we hadn’t tightened the pipes down enough. With the confidence of Gerard Butler from 300 and the arms of a much smaller Gerard Butler from 300, Bryce declared that if the pipes leaked again after he had tightened them he would pack up all of the equipment himself and take it back to our lab on the other side of campus. The team discusses the valve opening sequence. Spoilers: the pipes leaked again. Prior to our upcoming cold flow test we’ll be doing another leak check of the plumbing. 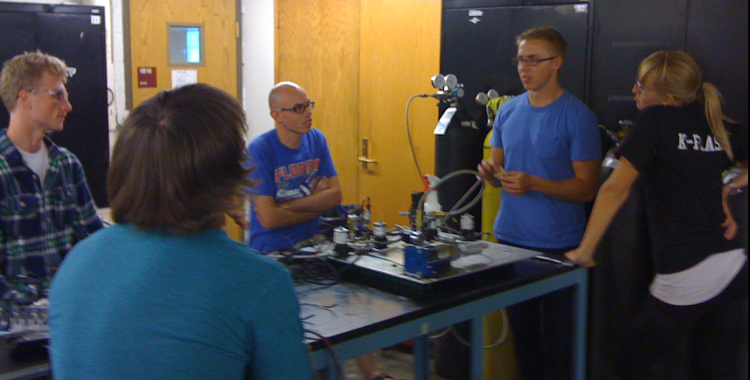 This first test was just at 200 psi so we could do it on campus, but the real deal will be at much higher pressures. The electronics we used at this test were a stepping stone to the full system we are building for cold flow, but we were able to confirm the electrical and software design that controls the opening and closing of the valves. We met our goals of testing the hardware and teaching the new guys how to do a proper leak check so it was a successful night all around. Yes, even for Bryce, whose teammates helped him take the hardware back and who wrote about the day absolutes died.